Marvel makes exceptional refrigeration systems for your home and we repair them. They are pretty attractive appliances and here is some information on them. New at Marvel are upgrades to the already top-notch Professional Collection of undercounter refrigeration systems. More storage options and sleeker aesthetics are part of the upgrades, along with black interiors, tri-color lighting, ball-bearing glides, convertible shelving, and complementary accessories. These appliances aren’t just eye-catching! They provide optimum organization, full-capacity, and energy savings along with the contemporary design of high tech appliances, all wrapped up in one pretty package. Featured products in the professional Series are the Clear Ice Machine, Wine and Beverage Center Models with Display, Wine Center, and undercounter refrigerator and freezer models. Eco Ice mode gives the tri-color illuminated clear ice machine 25% in water and electricity savings while providing a clear (and quiet!) product. 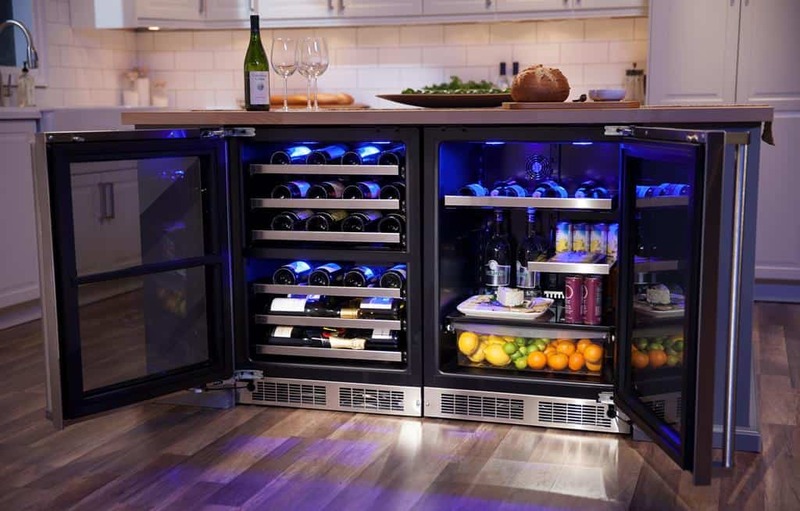 Undercounter wine and beverage centers offer controlled temperature zones, thermal efficient cabinets, UV-resistant dual pane glass doors, cantilevered shelving, and touchpad controls, along with maximized capacity and theater-style lighting. Marvel also offers stainless steel beer dispensers in single or twin tap models for home brewers, beer connoisseurs, or just those who love to entertain. Marvel’s beautiful beer dispensers are ready to be the life of the party. Besides all the hip upgrades, Marvel products continue to provide reliable undercounter beverage and refrigeration design for today’s lifestyle. Low-profile ADA (Americans with Disabilities Act) compliant models are part of the selection. Undercounter appliances offer a convenience and aesthetic that traditional boxy appliances don’t. They fit seamlessly into kitchen design while providing convenient access and reducing foot traffic. Marvel offers a full line of luxury products to fit your lifestyle. With a history spanning the decades back to 1892, Marvel is the oldest refrigeration company in North America. This means that Marvel has perfected refrigeration in keeping with the latest design and technology, while preserving its reputation for quality. If you have a Marvel, keep in mind C&W Appliance Service when it needs repair. Give us a call at (855) 358-1496 or fill out our online form.